Answering Machine Not Picking Up? Posted: Fri Feb 03, 2012 11:31 am Post subject: Answering Machine Not Picking Up? I installed MJ+ last week. I could call out OK, but discovered the phone was not ringing for incoming calls. I did a search of the topic on the MJ website, but their suggestions did not work. I contacted chat and was told that because my number was being ported, the phone would not ring until that was completed. I got an email from MJ this morning saying that was now complete. I can now call out and get incoming calls. Now, my answering machine will not pick up when I get a call. The MJ website said to set the answering machine to pick up after 3 rings. I did that, but it still won't pick up. I even tried setting it for 2 rings, with no luck. I contacted MJ chat, but they offered no other suggestions other than to, "check the answering machine users manual". Gee, thanks! It was working fine, until I switch to MJ. Is it going to mj voicemail? If so, after how many rings? Make sure the answering machine isn't set for custom ringing. Also, did you disconnect the original landline from the mix either at the side of the house or in the basement? Edit: It's also very possible that the answering machine isn't detecting the ring depending on how many phones you have hooked up. Yes, the MJ+ voicemail is picking up after 5 rings. I've tried setting the answering machine set on 2 and 3 rings, but it just won't pick up for some reason. I've done many searches, but the only suggestion is to back off to 3 rings. I assume that has worked for everyone else?? I have my answering machine set for 4 rings and it works without issue. It really sounds like the am isn't registering the rings at all. Is the actual base associated with the am ringing? There might not be enough ring voltage from the mj to make it ring(or ring correctly) so it won't know to pick up. I had a similar problem before MJ Engineering did something magical. It turns out the phone rang but there was no incoming voice. Once there was incoming voice, the answering machine picked up. My answering machine, too, will not pick up. (Incidentally, there's something different about the MJ ring -- the individual rings are shorter than the AT&T rings. But in any case, I can turn VM completely off on MJ, and my machine will never pick up. 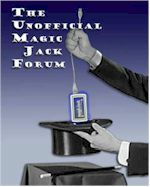 What "magic" did MJ Engineering do to enable "incoming voice," which allowed your home machine to work?